SEWARD — Ever since we learned that Mount Marathon's record book is not written in stone, Alaskans have almost gotten used to seeing the mountain yield one men's record after another. It happened in 2013, 2015 and 2016. It didn't happen this year. 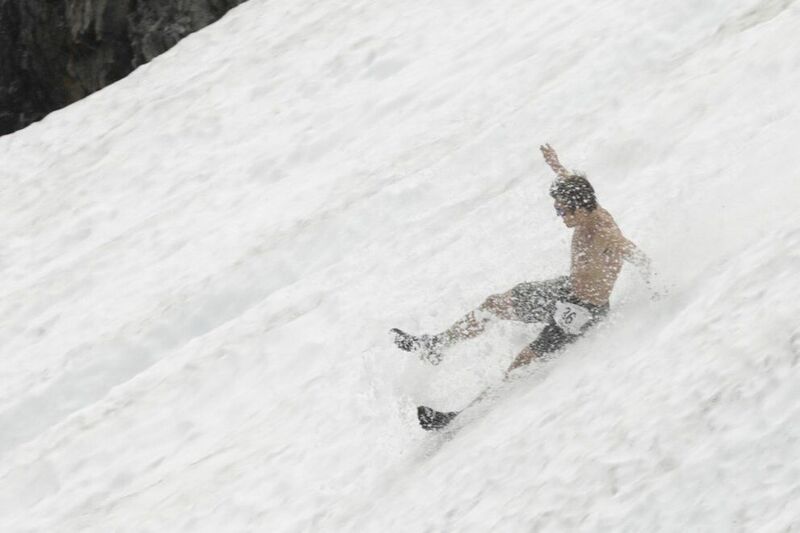 But David Norris of Anchorage and Max King of Bend, Oregon, nonetheless provided plenty of Fourth of July sizzle on the 3,022-foot peak that stands guard over this town. They ran the third and fourth fastest times in the history of the punishing race, which has been held 91 times since 1915. Norris, the 2016 record-setter and a world-class cross-country skier, reigns as king of the mountain despite a valiant effort by King, a Mount Marathon rookie with an outstanding running resume. 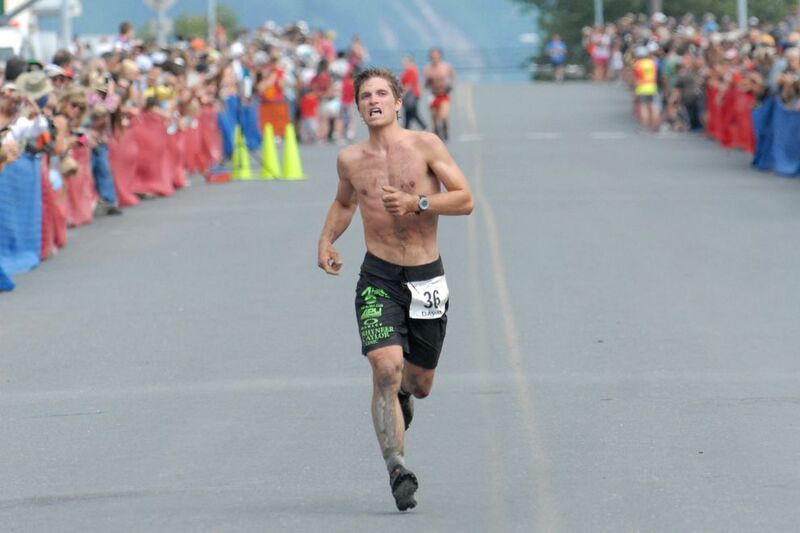 Norris, who is 2-for-2 in Alaska's most famous race, triumphed in 42 minutes, 13 seconds. King, 38, was second in 42:33, reducing the gap from 30 seconds to 20 seconds on the half-mile of pavement between the base of the mountain and the Fourth Avenue finish line. "I tried to make you hurt," King told Norris in the finish chute. Norris, 27, felt plenty of pain. 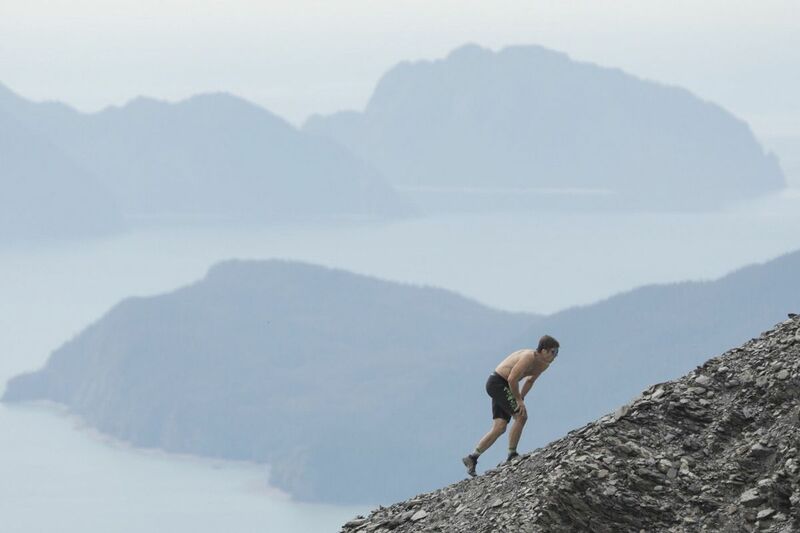 Though he beat King to the top of the mountain by 30 seconds, he looked labored as he climbed, hunched over and breathing hard as he mostly walked to the turnaround point. Behind him, King looked buoyant by comparison. "I didn't feel as light in my legs as I did two years ago," Norris said. "I planned on running quite a bit of it — I've been able to run in preparing for it, but my legs felt heavy." Norris finished 47 seconds off his record of 41:26 and 25 seconds off the 2015 time that briefly made Spain's Kilian Jornet the record-holder and still ranks as the second fastest in history. Norris and King both eclipsed Eric Strabel's 2013 record of 42:55, which at the time took down Bill Spencer's iconic mark of 43:21 from 1981. The times by Norris and King rank third and fourth on the all-time list, dropping Spencer's time, which from 1981-2013 was the standard-bearer, into 10th place. "I'm happy with how I pushed it," King said. "After I rounded the rock (at the top of the mountain) I thought, 'This is it. This is the chance.' But he's fast on the downhill." Norris got new life on the wicked descent even though he took a spill on the steep slope and shoulder-rolled down a few yards. "Once I fell, I was trying to let my body do its thing," he said. "I got up, shrugged my shoulder to see if it was hurt, and everything was fine." Norris said he briefly eased up once he transitioned from the mountain to the road, but he knew he couldn't coast to the finish line. King was too close. "I got my breath back and when I got to the road, I took the first 100 meters a little relaxed to get my legs back," he said. "I looked back and couldn't see him, and that felt comforting." More than three minutes passed before Norris and King had company in the finish chute, and then the chute filled up fast. In a 39-second span, four racers arrived — Adam Jensen (45:41), Matt Shryock (45:52), Ben Marvin (46:17) and Luke Jager (46:20). Until Wednesday, the 46-minute barrier had been broken only 63 times. Jensen and Shryock, who are both from Anchorage, added to that number despite temperatures in the 70s that cooked the mountain. "It was awful," said Jensen, 37. Jensen caught and passed Shryock on the downhill, which is the opposite of the way things usually go between the two. Usually, Jensen is the better climber and Shryock is better on downhills and flats. "We reversed roles," Shryock said. "I got him at the top, but he blew by, man, on the shale. He did a front flip right in front of me." Jager, an 18-year-old from Anchorage, made an impressive senior debut after three consecutive victories in the junior race, which goes halfway up the mountain. "It's more than twice as hard," he concluded. "It's a whole 'nother beast. "… I wanted top five and if it was 20 meters shorter, I would've had it." Foiling Jager's plan was Palmer's Ben Marvin, who outsprinted Jager in the final half-block to claim fifth place. Cloud cover and a bit of a breeze helped keep things from turning into an inferno for the men's race, which started at 11 a.m. But the heat didn't totally slow things down, as evidenced by the four sub-47s. A sub-48:00 was required to make it into the top 10, and two age-group records were set. King replaced Strabel as the 30-39 record-holder. And Barney Griffith of Anchorage, who turned 60 in December, shattered the 60-69 record and now owns two Mount Marathon age-group marks. Griffith easily beat his age by running 53:34, a performance that lopped nearly six minutes off Thomas Coolidge's 2013 record of 59:14. "That's my deal now," Griffith said. "That's all I can look at now." Well, not exactly. Griffith placed 27th overall, ahead of everyone in the 50-59 age group. Of those who finished ahead of him, the closest in age was 47-year-old Matias Saari, the 2009 champion who placed 13th to end a run of 10 straight top-10 finishes. Karl Romig, who has the bad fortune to be the same age as Griffith, also eclipsed Coolidge's mark with a time of 57:09. Griffith, whose personal record is 46:54 in 2003, crushed his time of 56:16 from last year. He said he's able to keep pace with younger runners in part because he trains with younger runners. "My friends are mostly in their 40s and I have to hang with them as much as I can. It's a friendship thing."